I’ve been making the “second basemen bat second” joke about Don Mattingly for so long that I’m not even sure when it stopped being a joke and started turning into reality. Now, either the joke has become self-aware, or Mattingly is just enjoying messing with us all, as he did the other day when I was part of a group of reporters who were told that Sam Demel was absolutely starting the game that Julio Urias ended up starting barely 24 hours later. Bet you didn’t think “neither” would be the answer to “does Alex Guerrero or Dee Gordon start the first game of the season at second base,” did you? The merits, or not, of Turner over Gordon for a single game aren’t all that interesting to me, though it’s not really a selling point that a team worth eleventy billion dollars is starting a guy who the Mets — the Mets! — decided they didn’t want. (Also, since Arizona starter Wade Miley is a lefty, maybe Mattingly really is going with his “platoon” idea at second base, which Brim will have much more on in the morning.) This has no bearing on Guerrero, either, since I think we all knew he was headed to Triple-A. 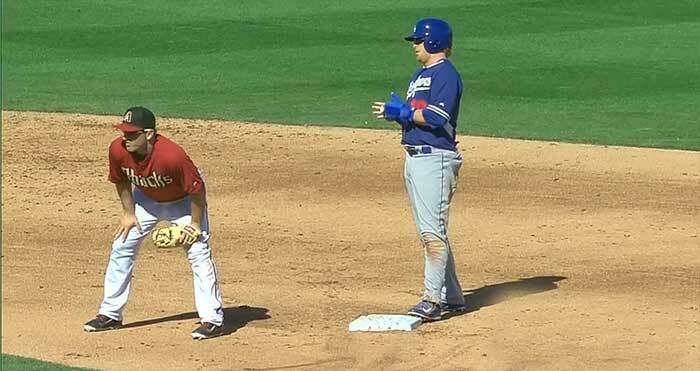 Scott Van Slyke will hit fifth in left, two spots ahead of Andre Ethier, and… well, look. We’ll get to the lineup stuff closer to the game. Right now, I like focusing on the idea that the second baseman is, in fact, hitting second. (Baltimore was the only team not to, since Manny Machado started at the No. 2 spot 154 times.) The Giants, with Marco Scutaro, and the Mets, with Daniel Murphy, had a second baseman in the position regularly. The Dodgers, like several other teams, had a lineup in flux. So maybe the second baseman doesn’t always hit second, because last year they did only 41.9 percent of the time. So far in 2014, it’s happening 100 percent of the time. Based on this totally relevant sample size, I predict it will happen in every single game of this season, until it does not.